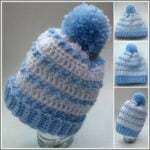 This striped baby hat pattern is given to fit a baby. However, it is easy to crochet to any size you want from newborn to adult. It features a nice striped design that can be crocheted in two or more colors. Or, choose a single color to do the entire hat. It’s a great design for both men and women, thus making it a great pattern for the entire family. The pom pom is optional, but it adds a nice touch to any hat whether for child or adult. I made mine with a single color, but choose as many colors as you like for a super cool pom pom design. Here is a quick tutorial on how to make a pom pom. This hat is a match for these striped baby leg warmers, which can also be crocheted to any size you need. You might also be interested in this roundup of hats for baby boys. Purchase an Ad-Free PDF or scroll down for the free version. Circumference over body is 14″. Ribbing is about an inch shorter. Bead St: Insert hk into indicated st, yo and pull through, (yo and pull through one lp on hk) twice, yo and pull through both lps on hk. When you work into the next stitch make sure the bobble is facing. Instead of fastening off at each color change, carry the yarn up until you are finished with it. The hat is worked in one piece starting with the bottom ribbing. The body is crocheted right onto the bottom ribbing. The bottom ribbing rows are worked lengthwise, whereas the body is worked in rounds. If you need to make the hat wider, simply increase the number of ribbing rows in multiples of two. If you need it longer do more repeats of rounds 2-5. Rows 2-50: Working in bls only, ch 1, sc in each sc across. Turn. (6 sts) Continue with this row until you have reached a desired circumference. Ch 1 and join the ribbing rows by slip stitching the last row to the free lps of starting chs. You might have your own way of doing it, but I like to join the front loops of last row worked to the free loops of starting chains. Rnd 1: Continue with CA, ch 1, sc 50 sts evenly around; join with sl st to first sc. (50 sc) Do Not Turn, but begin working in rnds. Rnd 2: With CA, Ch 1, bead st in first st, sc in next st, *work bead st in next st, sc in next st; rep from * around; join with sl st to first bead st.
Rnd 4: Take the lp on hk and pull it up as high as a dc, dc in same st as join and in each st around; join with sl st to first dc. Rnd 5: Same as rnd 3. Rnds 6-21: Repeat rnds 2-5 another 4 times. FO at last rnd leaving a long enough tail to weave into the last round. Weave the tail end of the yarn into the last rnd made. You don’t have to weave it into every stitch; I did mine in every 3-4 stitch. Pull as tight as you can and secure the yarn. Make a pompom and attach it at the top center. Pair this with other baby patterns for a baby shower. 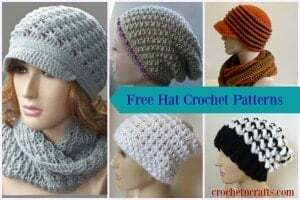 Or, check out more crochet hat patterns here on CNC.